Any inbound marketer knows that forms are an essential element of a good lead capturing strategy. Forms gate your premium content offers and allow you to capture essential details about your leads. A well-structured form can provide your marketing and sales teams with the key information to help them close the deal. Unfortunately, many marketers seem to be unaware that form strategies aren't exactly one-size-fits-all. Countless companies make the mistake of serving the same exact form over and over again, on pieces of content throughout the funnel. This is a critical error that can ruin your lead generation efforts. 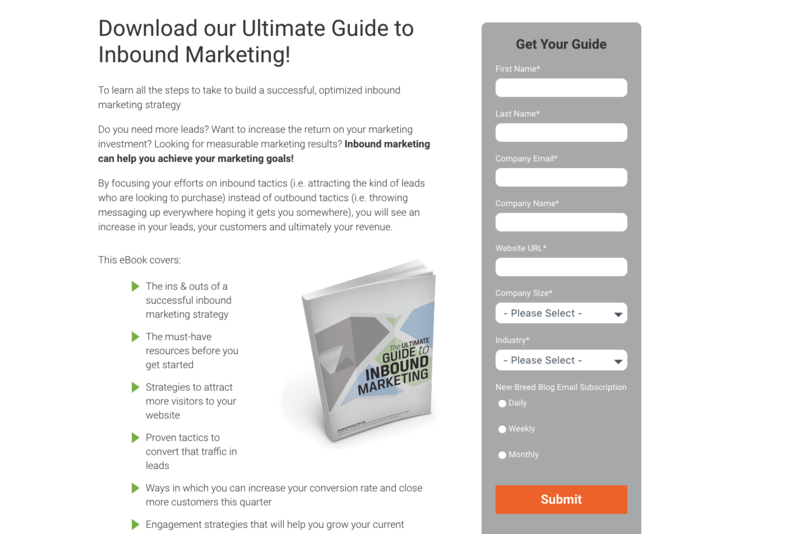 Using HubSpot's best practices will set your team up for inbound lead generation success. Your forms must mirror the detail and value of their associated content offer and their position in the buyer's journey. 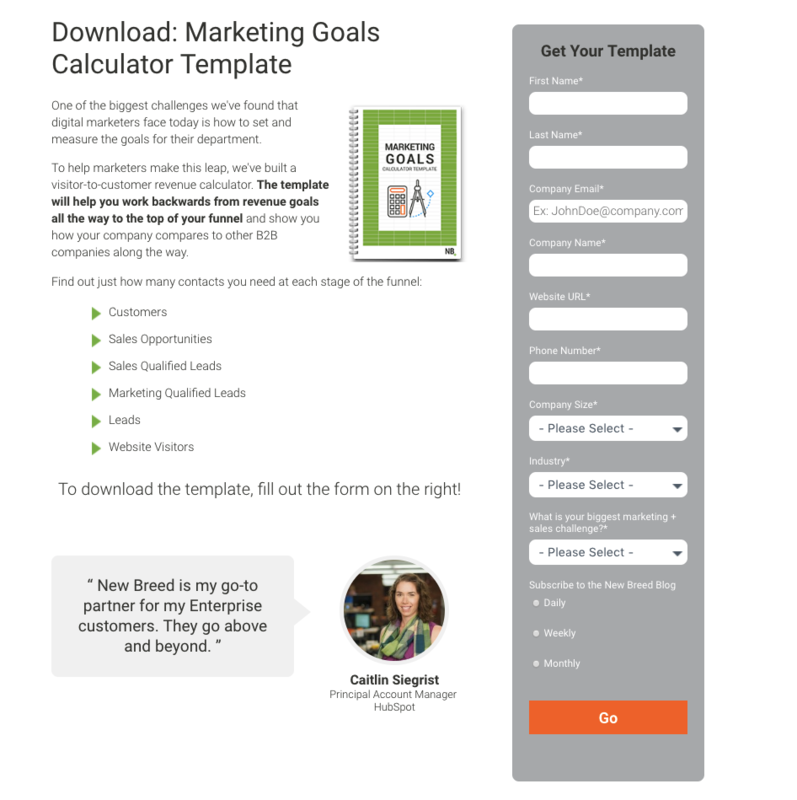 Creating your forms with content value and buyer stage in mind will promote lead generation and help shape the way your marketing and sales teams engage with these new leads. To begin creating a form strategy, you must make sure you have a comprehensive understanding of the inbound buyer's journey in conjunction with the sales funnel. These two models work cohesively to help unify the efforts of your marketing and sales teams. The stages of the B2B buyer's journey can be broken into three parts: awareness, consideration and decision. Each section of the buyer's journey corresponds with two sections of the sales funnel. Buyers in the awareness stage are in the top of funnel as visitors or leads. In this stage, the buyer is realizing their problem and starting to research potential solutions. This stage of the buyer's journey is primarily educational and research-based. Buyers in the consideration stage are considered to be in the middle of the funnel. In this stage, the contact is classified as a Marketing Qualified Lead (MQL) or Sales Qualified Lead (SQL). At this point, the buyer begins to evaluate potential solutions to the problem they researched in the awareness stage. Last is the decision stage, where buyers are considered an opportunity or customer. This stage of the buyer's journey signifies that the user has decided on a solution for their problem, they are ready to purchase and now they are considering a specific brand or provider. If you follow inbound best practices, you already know that your premium content offers should be created with these different stages in mind. The hard part is building effective forms to correspond with each piece of content. 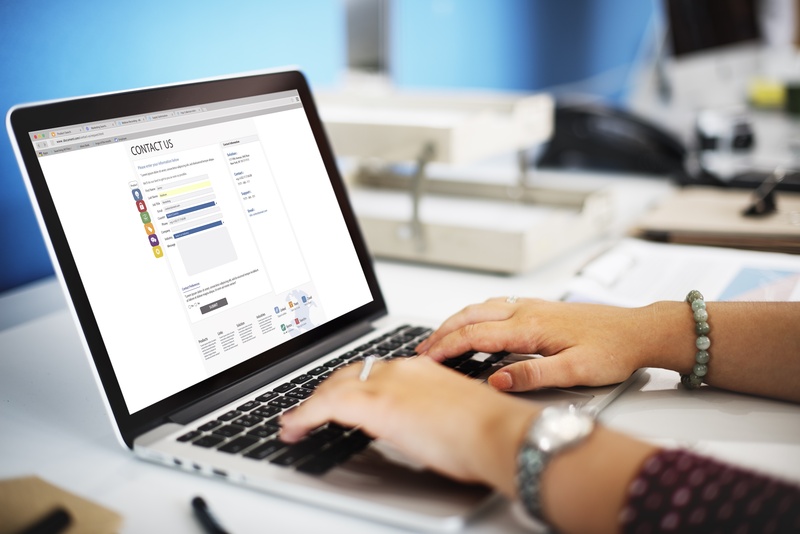 Luckily, you can take the guesswork out of form creation by adhering to an inbound form strategy that aligns with your buyer's journey and sales funnel. Making forms with the buyer's journey and funnel stage in mind can streamline operations and drive lead generation. Top-of-funnel content lives in the very first stage of the buyer's journey, the awareness stage. Examples of top-of-funnel content are offers like guides, ebooks, whitepapers or checklists. These are primarily educational assets that can help the buyer in their research process. Because the user is only in the very first stage of the buyer's journey, you don't want to overwhelm or alarm them with a lengthy, overly-personal form. Nobody wants to share a ton of personal information right off the bat. Top-of-funnel forms should be thorough enough to give your sales and marketing teams adequate information to pursue the lead, but broad enough to make the lead feel comfortable with sharing. Details like name, company, company size, email and industry are usually safe bets for TOFU form fields. These elements provide enough information for your marketing and sales teams to follow up, without being too personal. Next is the middle-of-funnel content. This is the "consideration stage" of the buyer's journey. This content usually takes the form of templates, calculators, product webinars, case studies or demo videos. These pieces of content show that the buyer is deciding whether or not your solution could be a good fit for their business. Because the buyer is showing a more high-involvement interest, you can ask for more personal details without being too invasive. Phone number, for instance, is a MOFU detail that allows your team to follow up with the lead in a more personal way. Gathering details like "biggest challenge" allows your team to better understand the problems of the lead and how your business can be a potential solution to that problem. By capturing this type of information, your team can better tailor their sales conversions and build rapport. Last is the bottom-of-funnel content. 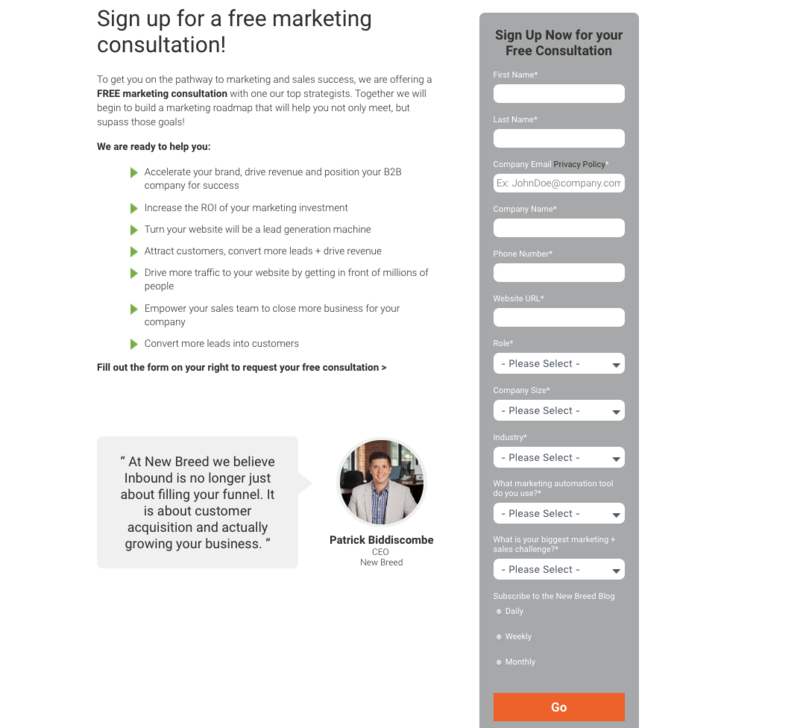 This funnel stage is associated with content offers like demos, trials, estimates and consultations. Being that this is the highest-involvement stage of the buyer's journey, it makes sense that the form associated with this stage will be the most detailed. Make sure you are asking questions specific to the BOFU content offer. The answers to these questions should help your team better deliver on the trial, demo, consultation, etc. For example, at New Breed, we ask the lead what type of marketing automation they use. This information helps us better understand their problem make sure that the lead is getting the most out of their marketing consultation. Always consider the perspective and lifecycle stage of the buyer when creating your forms. If they are still a lead or visitor in the awareness stage, keep your forms short and sweet. Once they move down the funnel and into the consideration stage, you can get away with more detailed, personal questions. In the decision stage, the buyer is clearly interested in what your company has to offer. Choose form questions that will help your team better understand the lead's pain-points and goals. Lifecycle stages aside, always remember to use best judgment when creating form questions. Only ask questions that will enhance your engagement with this lead. Figure out what information will help your team deliver and create your form questions from there.